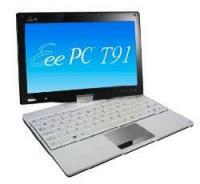 Asus Eee PC T91MT specifications, info. This updated version of the Asus Eee PC T91 features a multitouch display, twice the storage space, and Windows 7 Home Premium. Asus Eee PC T91MT news and review links.